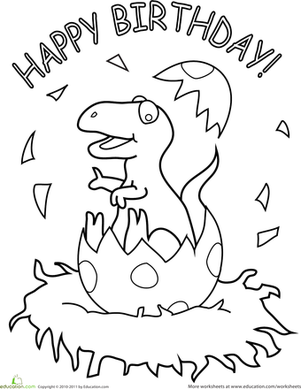 There's something magical about the idea of a hatching dinosaur egg. 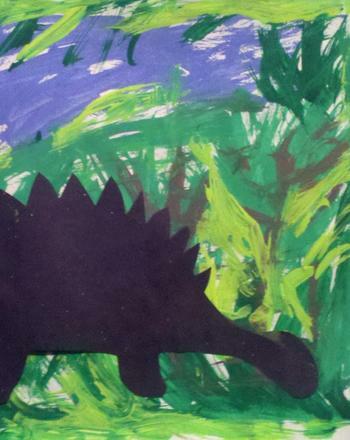 If you have a young dino-enhusiast on your hands, this is the perfect activity to keep him occupied on a long afternoon. 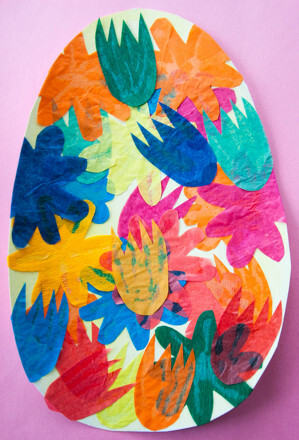 Crafting the eggs is a simple exercise in papier-mâché construction that will help hone developing fine motor skills, and your kid will have a blast decorating the egg whatever way he pleases. After he's completed the project, wait for the perfect moment and hide a baby dinosaur toy inside the egg. Your kid will be thrilled when he discovers there's an actual dino waiting to hatch from his egg! Cut along one side and across the bottom of your large garbage bag to create a large rectangular sheet of plastic. Place the plastic sheet over your work space to protect the area from any messes and to make the clean-up process easier. Have your child cut the old newspaper into long strips and place the strips into a large pile in the center of your work surface. Let your kid help measure three cups of flour into the large bowl. Add one and half cups of warm water to the flour and combine. Take over and inflate one of your balloons and tie off the end to prevent any air from escaping. Have your child place one of strips of newspaper into the flour and water mixture. Cover the strip completely. Wipe off any excess and lay the strip over the balloon. Press down along the strip to remove any air bubbles under the paper. Encourage him to continue applying strips until the entire balloon is completely covered with paper. Leave the balloon for 24 hours or until it's thoroughly dry. Use your scissors to snip a small one-inch flap opening in the bottom of the form. Do not cut a complete hole because you'll want to close it up again later. Push the point of the scissors into the balloon to break it, and then gently pull the balloon out of the form. 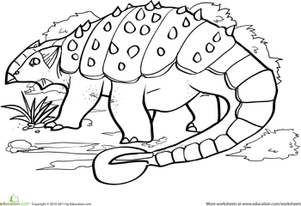 Have your child use the brushes to apply paint to the dinosaur egg. Allow the paint to dry completely. If necessary, have your child add a second coat. When the egg is dry and your child isn't looking, place a small dinosaur toy through the opening at the bottom. Once the figure is inside the egg, tape the opening shut with clear tape. Wait for him to discover what's hidden inside! 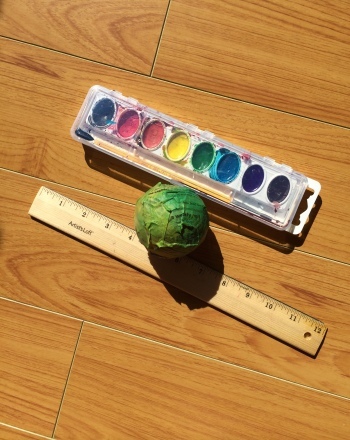 If you are doing this activity with several children, you can have them each create an egg. As a group, the children can measure the length and circumference of each of the eggs and create a chart to record the data. Help your kindergartener celebrate spring with this dot to dot coloring page featuring a baby duck hatching from its egg. 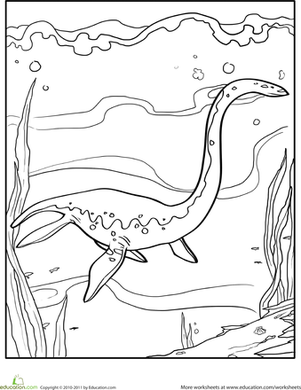 Your kindergarten artist will giggle through this one, coloring this dinosaur (and his cute golf hat) as he's mid-backswing. 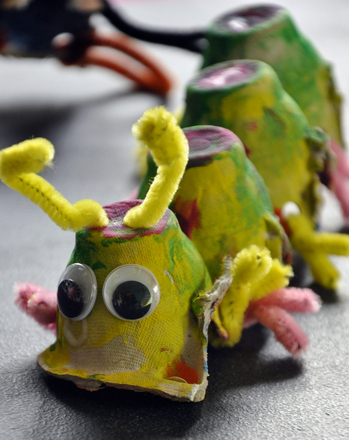 Use egg cartons to create imaginative spiders the kids will treasure.